Hermes Lindy, the new style released by the legendary French luxury goods house Hermes, made its first hit with pastel colors in Spring/Summer 2007. 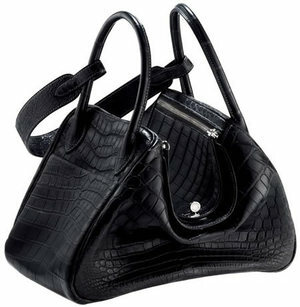 The Lindy bag combines the up style of Hermes and multi-function with shoulder strap option and adjustable capability. After its resounding success in runway show, Lindy has been snapped up in famous fashion cities like Paris, Florence, and Milan etc, and spread flaming popularity through the intertwined fashion world with incredible long waiting lists. Thanks to its unique design accenting both style and function, Lindy bag is widely considered to be the next ‘It’ bag equivalent of Hermes other luxury bags. Lindy is a very fun, stylish and practical bag which can be transformed into two different looks for a tote or a shoulder bag. Probably, Hermes, the king of fashion, aims to launch the product with a target to modern and well-heeled youngsters, because Lindy bag is a good mix between casual and elegance, versatility and high-fashion. 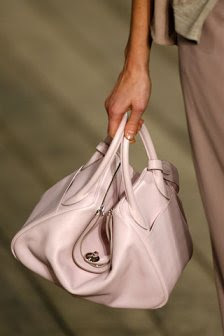 Quite the contrary from what Hermes used to do, this bag is of easy access and huge convenience when traveling around. Admittedly, Lindy bag is on its way to the household staple of Hermes. It comes into two sizes 30cm or 34cm and features dual sided compartments for separate use, two exterior pockets and another two inside, double handles and a shoulder strap. Interesting as it is, the bag is for holding a lot and a little with both trendy appearances. 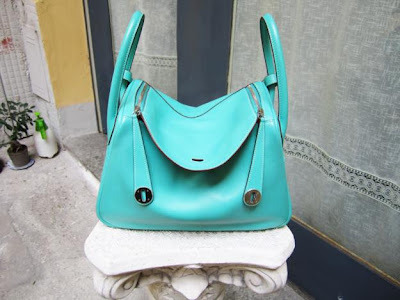 When comparatively empty, it bends in the center and can be toted by two top handles; if you want to take all necessities and stay gorgeous as well, it expands to hold all and is perfect for being carried over the shoulder. The four pockets, two exterior and two interior, supply a great storage for small accessories like cell phone, IPod, wallet, and keys. 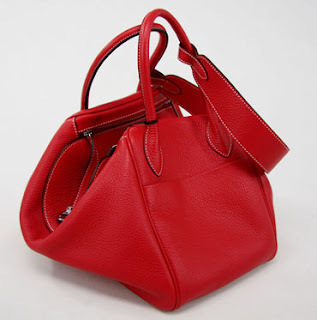 Lindy bag appeals to fashion ladies who are fond of changing their styles occasionally. You buy one bag but actually with two different shapes. Hand-held or shoulder carrying, the bag is doomed to be eye-capturing and sought-after. The same as other bags of Hermes, Lindy bags come a vast selection of materials and colors. The materials most used for Hermes Lindy are Clemence and Swift, others like exotic matte croc skin and bi-material toile and leather. Clemence leather is calf leather from baby bull. It is sumptuous, heavier and durable. Swift, a kind of buttery soft calf skin, is slouchy, sturdy and squishy. Clemence comes in Gold, Blanc, Blue Jean, Brighton Blue, Rouge, Rouge Garance, Raisin, Black, Raisin, Etoupe, Pumpkin, Vert Olive, Vert Anis and a few more. Vert Anis is Bright Apple hue, a wonderful shade of green. Swift has a smaller range of colors and the classic Rose Dragee is available in swift only. These luscious leathers and lovely colors are often accented with polished palladium hardware. With casual elegance, youthful touch, great fun and super function, Hermes Lindy will absolutely stay around in the repertoire of Hermes bags. If you are enchanted by this wonderful bag.